Judy Garland&apos;s love letter to Frank Sinatra is up for auction. 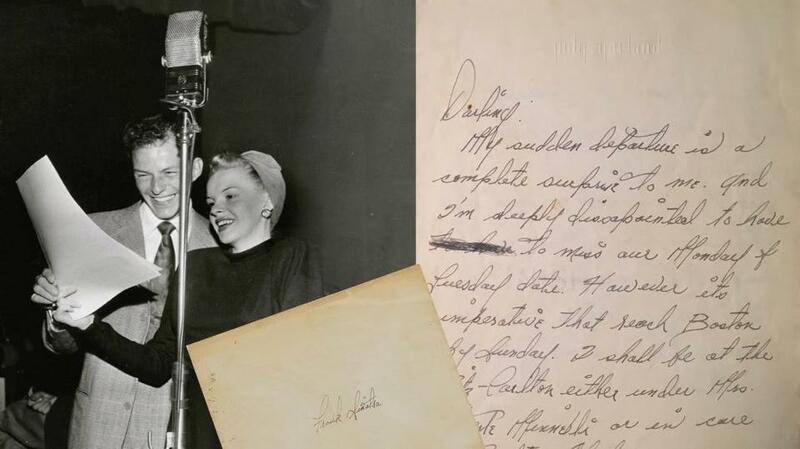 A poignant love letter penned by Judy Garland to Frank Sinatra on the eve of a trip Garland was taking to Boston is up for sale. “Darling, My sudden departure is a complete surprise to me. And I’m deeply disappointed to have to miss our Monday & Tuesday date. However it’s imperative that I reach Boston by Sunday. I shall be at the Ritz-Carlton either under Mrs. Vicente Minnelli or in care of Carlton Alsop. You said today that you’d been negligent. But darling — that’s so unimportant compared to the great amount of happiness you’ve given me. I shant forget the hours we’ve spent together — ever! “I’ll let you know how everything goes on this trip. In the meantime — take good care of yourself — be happy and have lots of fun and laughs. And for Gods sake — keep those wheels in your lil ole head down to the minimum. Drop me a line if you can because it will cheer me up a great deal. I hope to talk to you tomorrow — but I wanted to write this in case we miss connections. Even if we do reach one another — I’ll send it anyway. Its getting late — so I’m gonna wash up. . .
Garland resumed her romance with Sinatra in 1955 while separated from then-husband Sid Luft, and the two remained friends until her death in 1969. The auction begins Thursday and ends Nov. 17.